People throughout Scotland are being asked to report sightings of one of Scotland's most beautiful and rare native flowers in a bid to help ensure its survival. 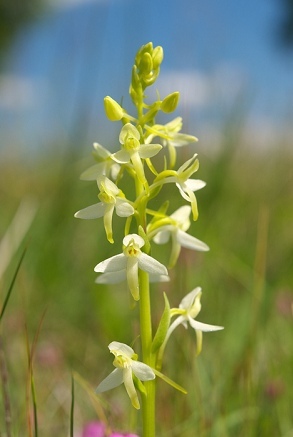 Scottish Natural Heritage (SNH) is asking people to lend their support to a survey by looking out for the Lesser Butterfly Orchid's distinctive creamy-white petals as they walk in fields, over hills and along roadside verges. Such is the Lesser Butterfly Orchid's perilous status that it in January 2007 the Minister for the Environment announced that it would become one of 32 species for special action under Scotland's Species Action Framework and it is being considered as a UK Biodiversity Action Plan species. The appeal follows a similar survey last year which revealed how the Lesser Butterfly Orchid has declined, leaving the West of Scotland as the remaining stronghold in the UK. Here the orchid can still be spotted in a wide variety of habitats, particularly in wet heath, bog, woodland edge, wet meadows, dunes, machair and the occasional golf course. A few good sites have also been found in the East of Scotland and four of the best Scottish sites had over 1000 flowering plants. SNH's Senior Species Adviser Lynne Farrell said "The Lesser Butterfly Orchid is a beautiful orchid which can be found growing in fields and on roadsides across Scotland. SNH is once again asking people to go out and search for the plant this summer, thereby adding to the excellent information obtained last year. The best time to look for the orchid is in June and July when it is flowering." "Last year hundreds of people from all over Scotland took part in the national survey. Thanks to this wonderful response to our request for information we received over 230 records of the Lesser Butterfly Orchid. With the help of our partners in this project, Plantlife and the Botanical Society of the British Isles, we now have a snapshot of how the orchid is faring in Scotland." in Scotland and do more to help its survival." Jim McIntosh, BSBI Scottish Officer said:"The detailed picture emerging from the analysis of the data sent in by people +-responding to this appeal has been enormously useful and exciting! Especially so, given the short flowering season of the orchid and the general scarcity of botanical experts who would have struggled to give such widespread coverage." People responded to the survey using a widely distributed colourful leaflet and available on-line. Liz Lavery, who has been analysing the results of the 2006survey for SNH, said: "I have really enjoyed following up the records sent in. Everyone taking part has been enthusiastic about this spectacular orchid. The website and leaflets have been a very successful way of collecting a great deal of useful information. I look forward to analysing this year's reports to see if distribution has changed over the last twelve months for the Lesser Butterfly Orchid." Or write to Lesser Butterfly Orchid Survey, SNH, Battleby, Redgorton, Perth PH1 3EW.